February 16, 1971 will always be remembered in Canada as the date of the “Fuddle Duddle incident.” It was on this day that Prime Minister Pierre Elliott Trudeau was accused of using unparliamentary language in the House of Commons. Nearly forty-eight years later, the incident remains a part of popular memory in Canada. Given that 2019 is an election year and that the elder Trudeau’s son is our current Prime Minister, it seems appropriate to discuss the comic aftermath of the incident this month. In the immediate aftermath, the elder Trudeau was only willing to admit to reporters that he had freely moved his lips. In response to one reporter’s question, he said, “What is the nature of your thoughts, gentlemen, when you say ‘fuddle duddle’ or something like that? God, you guys!” Ultimately, Trudeau never admitted to saying the more common expletive that he was being accused of using that day (though his son—and future Prime Minister—Justin Trudeau, would say in a speech in 2015 that his father did not only say “fuddle duddle”). 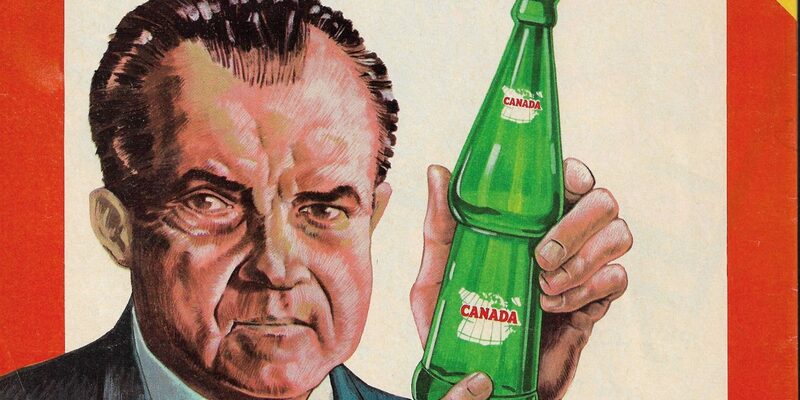 The phrase became a source of mockery and political satire across Canada and, particularly, in the province of Ontario. Political cartoonists mocked Trudeau in Canadian newspapers and media outlets covered the story with a fervour. 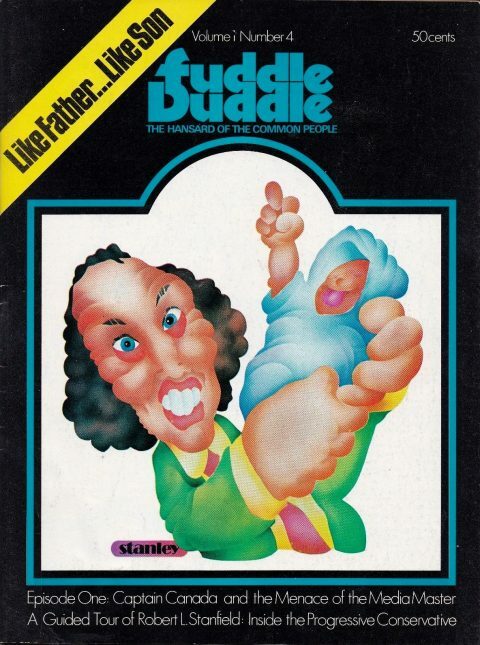 In the decades since, the phrase has become part of the pop culture zeitgeist in Canada, appearing from time to time in sometimes bizarre or unexpected ways (there is even a run called “Fuddle Duddle” at a ski resort that the elder Trudeau once regularly visited). 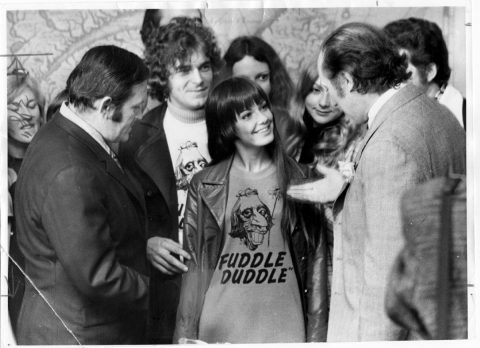 A Man and a Woman Wearing Fuddle Duddle T-Shirts circa 1971. Image taken from the Toronto Star. Nevertheless, it is this economic aftermath of the incident that is of interest here. In 1971, Fuddle Duddle became a cottage industry of sorts. Perhaps “cottage industry” is not the best term here, but there were various “fly by night” operations that started trying to profit from the humour of the incident. People stated selling buttons, T-Shirts, Trudeau dollars and various other kinds of materials that depicted a cartoonish Trudeau and/or were emblazoned with the words. Even a couple of musical acts got in on the fun/cash grab. For example, Doug Riley of the Toronto Jazz group Dr. Music put together a parody song under the name The House of Commons and released a 7” 45 rpm single called “Do the Fuddle Duddle” in 1971. During the same year, Hamilton, ON record producer/engineer Greg Hambleton released his own song, “Fuddle-Duddle,” under the name The Antique Fair. 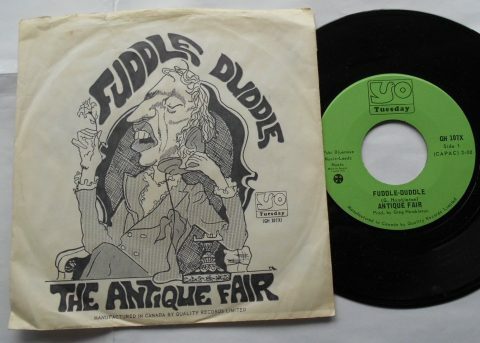 “Fuddle-Duddle” by The Antique Fair. 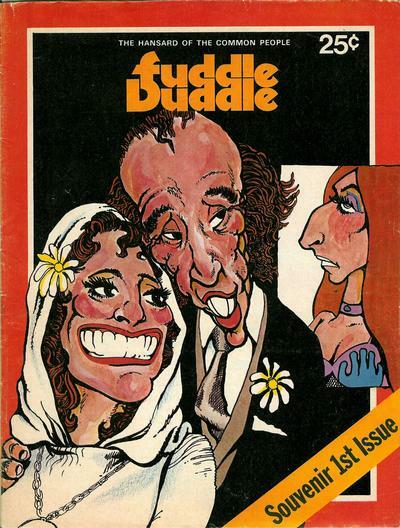 The cover art offers a common caricature of Pierre Elliott Trudeau, which was the omnipresent style of political cartoonists of the day. Image taken from a long-ended eBay auction. For all of the hubbub that surrounded the incident and subsequent cash grab/cottage industry of fuddle duddle swag, there is one result of this situation that should be on the radar of Canadian comic book collectors: Jeffrey R. Darcey/JRD Publishing’s five issue series Fuddle Duddle: The Hansard of the Common People, which was published from 1971-1972 (presumably beginning in June, 1971, though the exact dates of publication are unclear, as they are not listed in the indicia of the first issue). 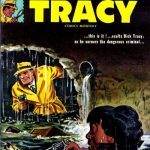 The indicia states an ambitious goal of releasing the comic “10 times yearly,” but unfortunately the magazine did not last long enough for this to come to fruition and its publishing schedule was bi-monthly at best. 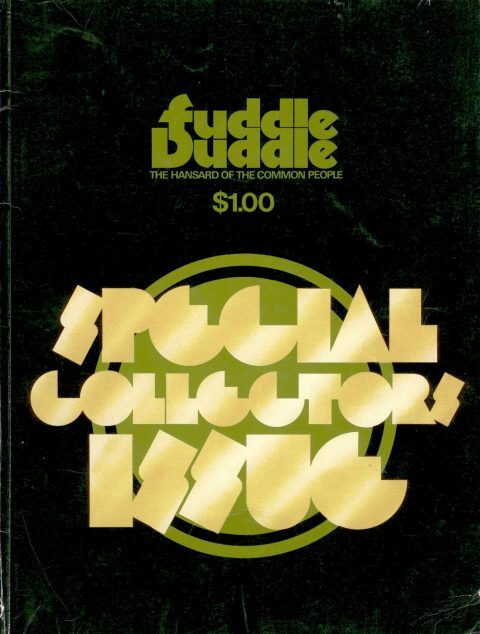 A sixth issue of the series, called the “Fuddle Duddle Special Collector’s Issue” was released at some point during the run, reprinting the first three issues together. I have never inspected the collector’s special and it’s entirely possible that the issue is made up of bound remainder copies. Each issue was magazine size (8.5” x 11”) and featured political satire. The design is somewhat reminiscent of Mad Magazine and other humour magazines from the era. The initial covers also share obvious similarities with the style that Time Magazine used at the time. Fuddle Duddle # 1 from my personal collection. All five issues feature cover art by Stanley R. Berneche. JRD’s first issue was edited by none other than Shuster Hall of Famer Stanley R. Berneche, who also provided the bulk of the magazine’s artwork for its entire run. Issues # 2 and 3 list William Jefferies as contributing editor, with issue # 4 claiming that “Mountie Python” was managing editor. 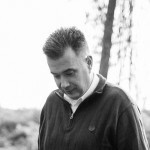 Bruce Rawlins acted as creative director throughout the series and Peter Evans was principle writer (with Jeffries receiving some writing credits as well). Dave Morris, Bob Prescott, Paul and Bunia Wyszkowska, Carol Anselm and “Yankee Rose” Mark Lloyd contributed stories or art to the final two issues. Fuddle Duddle # 2 from my personal collection. The first three issues of Fuddle Duddle are 32 pages in length, while issue # 4 and 5 have a 52-page format. All issues feature satirical cartoons by Berneche that are oriented towards members of parliament (especially then Conservative Party leader Robert Stanfield, NDP leader David Lewis and Prime Minister Trudeau) and sometimes other politicians. Every issue also includes “Hansard Highlights,” which are verbatim quotes of ridiculous things said by members of parliament at the House of Commons. For non-Canadian readers, a Hansard is an official transcript of parliamentary debates in the House of Commons. Fuddle Duddle # 3 from my personal collection. 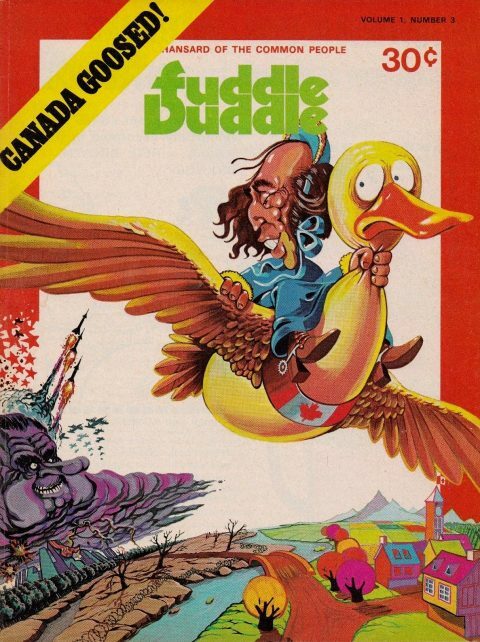 From a collecting perspective, there are numerous reasons why the five-issue run of Fuddle Duddle should appeal to people interested in Canadian comics. First, it was one of the first comic series to be published in Canada after FECA that had multiple issues and that had distribution beyond the region where it was created (as these were definitely sold elsewhere in Canada). Second, this series is pure Canadiana. Each issue offers parody and satire of the Canadian political system and politicians and there is also the occasional cartoon dealing with foreign relations. 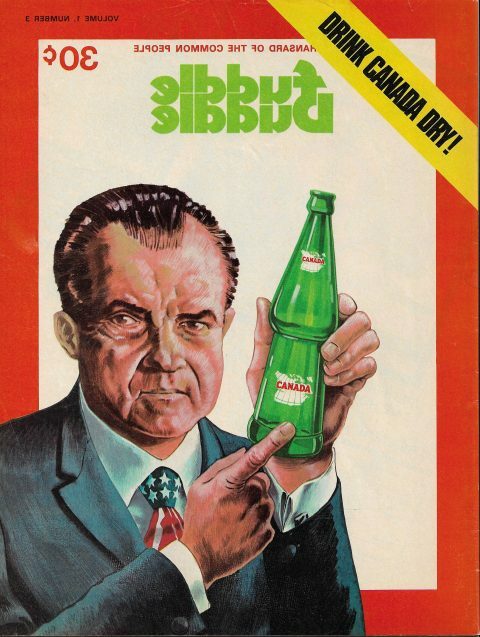 For example, issue # 3 depicts Richard Nixon and the United States as “drinking Canada Dry” and issue # 4 offers a parody by Bob Prescott of the Canadian government’s attempt to procure Panda bears from China called “From China with Love…” There are also various references to—and parodies of—the British monarchy throughout the series. 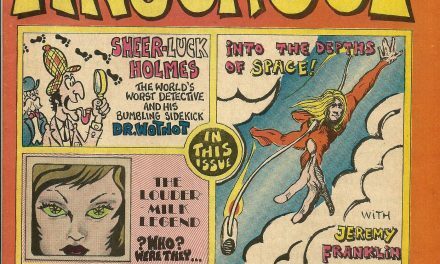 Third, issues of the series had larger print runs (the exact number is unknown) than many other Canadian comics that were published in the early 1970s, which was an era dominated by Underground Comix and the literary avant-garde. As such, an entry level collector of Canadian Silver Age comic books should be able to procure copies with a bit of patience. 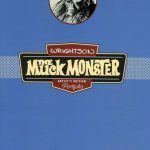 Finally, this series had a great enough impact on the comics community at the time that it was featured in the first issue of Bill Paul’s London, ON comics newsletter/fanzine Media 5, as well as in the third issue of Larry Mitchell’s Vernon, BC newsletter/fanzine Melting Pot. Back cover of Fuddle Duddle # 3 from my personal collection. Berneche’s art is delightfully cartoony and exhibits influences from the political cartoonists of the time (which makes sense given the subject matter and intention of the satire), while also seeming to draw influence from the American Underground Comix movement. The latter influence does not become explicit until at least issue # 3, which is much more sexualized and includes a long-form counter-culture oriented story called “The Quest” by Berneche and Evans. In his review in Melting Pot, Larry Mitchell is clear that issue # 1 is, “not very funny.” Indeed, the first issue seems particularly rushed and feels like the sort of cash grab that is exhibited by other fuddle duddle related merchandise from the time. Things start to get better with Evans coming on board as principle writer in issue # 2. However, it is “The Quest” that is really the turning point in terms of quality and content when it comes to Fuddle Duddle. 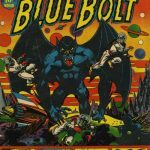 In actuality, Larry Mitchell’s review of the series (which came out prior to the publication of issue # 5) is much less critical of latter issues. Fuddle Duddle # 4 from my personal collection. 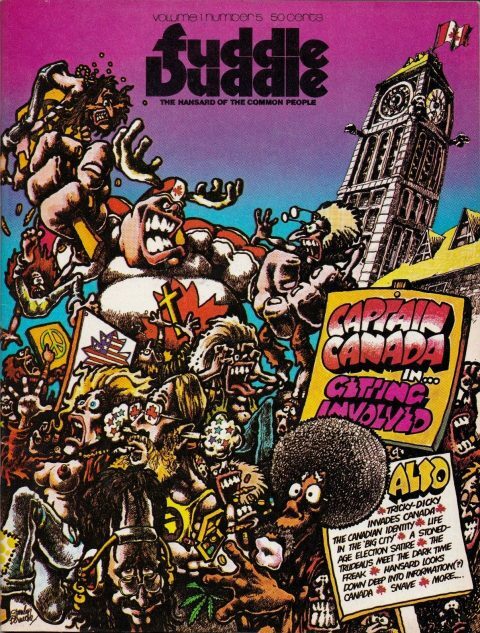 “Captain Canada Matches Mettle with the Monstrous Menace of the Media Master” from my copy of Fuddle Duddle # 4. This is the first appearance of Captain Canada and Beaver Boy. 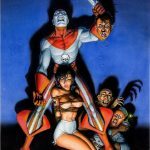 The characters do not first appear in issue # 3, as some internet sources state. 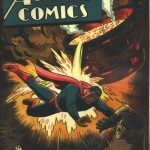 Captain Canada is noteworthy for collectors of Canadian comics because this was the first time since the end of WECA that a nationalistic Canadian superhero character was again in print. The character predates the much better-known Captain Canuck, as well as Jim Craig’s Northern Light (which first appeared in Orb magazine) and even Pierre Fournier’s Capitaine Kébec, all of which first appeared in the mid-1970s. This is memorable because of how significant that attempts to create a nationalistic hero were during the Silver Age, with additional examples such as Captain Newfoundland and Northguard appearing later. Captain Canada and his sidekick Beaver Boy appear for the first time in a ten-page story that was conceptualized by Robert Norton, drawn by Berneche and written by Evans. The story is also dedicated to Stan Lee. It is in this story (much like the work found in “The Quest” in issue # 3) where the creative partnership between Berneche and Evans reaches a level not found in the earliest issues of the series. Fans of Underground Comix will get a kick out of the slapstick characters, cartoon violence and scantily clad “woman in trouble.” There is also an element of sexuality found in this story that readers of earlier issues might not expect, as the hero and sidekick are both obsessed with beavers (which is not the first time that a Canadian Underground creator used this as a double-entendre) and Captain Canada’s catch-phrase being “Beaver’s Up.” The second and final Captain Canada comic story appears in Fuddle Duddle # 5. Fuddle Duddle # 5 from my personal collection. If issue # 3 is the turning point for the series, issue # 4 is the result of this turn. The quality of the art and writing reaches its highest point during the last two issues of Fuddle Duddle and the increased page size allows for several interesting additions to the creative team through its contributing writers and artists. By issue # 5, what had started out as political satire was a fully formed Underground-style publication. As I have already mentioned, Fuddle Duddle is a great series for people looking to start collecting Canadian Silver Age comics. This is because issues are often available. I purchased issues # 1-5 as a set in 2018 on eBay for around $40 CAD shipped. That said, I consider my purchase to be a fortunate one and I definitely underpaid for the collection. On the other hand, there are eBay sellers who are “shooting for moon” with their prices and several of the issues that are available as I write this are greatly overpriced in comparison to ones that I have seen sell online and privately over the past few years. For a solid mid-grade or higher copy of issues # 1, 2 and 3, buyers should expect to pay around $40 CAD each. In my experience, uneducated dealers will assume that issue # 1 is the most desirable (“It is issue # 1!”), but as I have explained this is far from the case. There is also quite a bit of misinformation on the internet, with numerous sources stating that issue # 3 is the first appearance of Captain Canada. It is not, though that has not prevented dealers for asking for hundreds of dollars for issue # 3. In my opinion, issue # 3 is more desirable than the first two issues because it is the turning point regarding the quality and content of the series, but it is not the first appearance of Captain Canada. The fact that all three issues are also available together in the collector’s edition special provides interested readers with an additional option. The collector’s edition special tends to sell for around $100 CAD for mid-grade or higher. I am not suggesting that these comics are always available, but a patient, consistent and persistent collector should be able to find them. Fuddle Duddle Special Collector’s Issue. Image taken from an old eBay listing. This issues contains the first three issues of the series bundled together. I have not had a chance to inspect one of these in person, but I suspect that it contains remainder copies. Issues # 4 and 5 are the most desirable and expensive issues of the series. 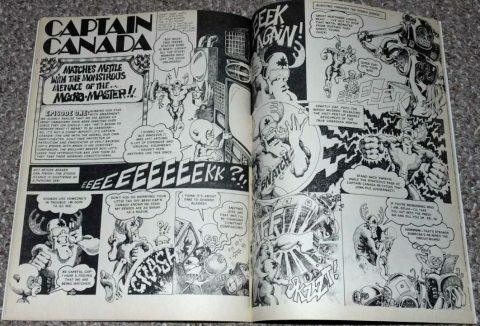 The Captain Canada first appearance and stories, as well as the larger sized format combined with fewer copies coming to market, make these two issues much harder to find. I have seen issue # 4 sell for around $75 CAD in the past and issue # 5 for around $50 CAD. In both cases, I am referring to specimens in mid-grade or higher condition. There is a good deal of information about Stanley Berneche on the internet. He was born in Windsor, ON in 1947 and studied at Mount Allison University in Sackville, NB (which is where he met Peter Evans) prior to moving to Ottawa. 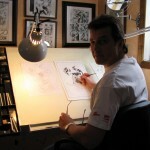 At the same time that he was working on Fuddle Duddle, he was also drawing the strip “True Tales of the RCMP” for the Canadian Boy Scouts magazine Trailblazers. 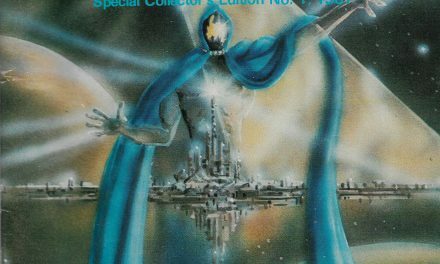 In 1974, he contributed to the first issue of James Whaley’s Orb magazine with his story “The Ride.” Afterwards, he continued to work in graphic design, but in non-comic book related mediums. The other contributors to the series also left the world of comics after the series ended, making Fuddle Duddle something of a creative curiosity as a result. As far as I can tell, Jeffrey Darcey did not publish any additional comics after Fuddle Duddle and JRD Publications essentially ceased to exist. Apparently, Darcey passed away in Ottawa in 2003.
brian Campbell is an Anthropologist based in Halifax, Nova Scotia, Canada. His PhD research focused on the used-goods trade in Halifax. Dr. Campbell is also co-owner of East Coast Toys and Games, one of Atlantic Canada's largest eBay stores specializing in pop culture collectibles. Dr. Campbell is taking a break from academia during 2019 to focus on his business. During his spare time, he researches Canadian comics that were released between 1960-1990. Great focus on this important series, Brian. Fuddle Duddle appears to be the bridge between the late 60’s fanzine and underground scene to the Canadian science fiction and superhero revival that begins 3-4 years later. Canada was beginning to stand up for itself and gain pride and confidence in its cultural (including pop-cultural) output with arrival of masters like Glenn Gould and Oscar Peterson, the acquisition of our own flag (1965), the pop music success of Leonard Cohen, Joni Mitchell, Neil Young, Lightfoot, etc., Expo ’67, and the international popularity of Pierre Elliot Trudeau, gave a boost to our cultural consciousness and openend the door to Canadian comic and animation (Nelvana Animation Studios). I’ll have to start looking out for these issues. Thanks, Ivan. I have to agree with your take here. Fuddle Duddle is somewhat transitional, starting as a parody and ending up having Underground-esque content and superhero flavour in the end. The creation of Captain Canada is, in my opinion, the biggest part of what makes this series a brief glimpse of what would come later. 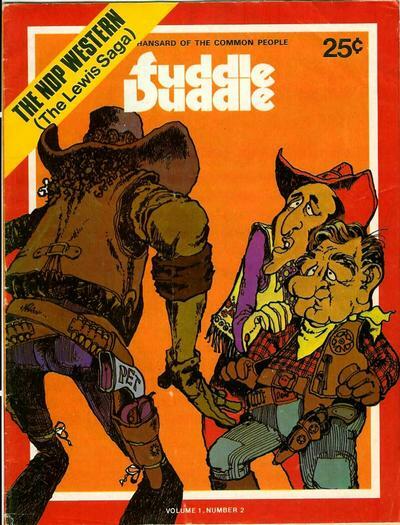 Some of the fanzines that predate Fuddle Duddle certainly revolve around superhero content, but the creation of a nationalistic superhero (even if it was comedic) separates Fuddle Duddle from said fanzines. That said, Orb is really what sets things in motion in terms of superb and serious science fiction and superhero content. I consider Orb to be one of the most important Canadian series of the 1970s. 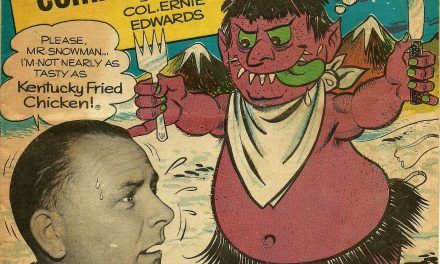 The comic output of French Canadian creators from the late-1960s to early-1970s is where the strongest amount of parody takes place in the early Silver Age. Quebec was undergoing its own cultural revolution, which manifested in comic books in what has been called “le printemps de la BD québécoise” (aka the springtime of Quebec comics). The influences are different from what we see in English comics (though there is some overlap), but the comedic elements propel many of the early bande dessinée québécoise (particularly BD, L’Ecran, Made in Kébec and Capitaine Kébec). Eventually the longest running Canadian comic from the era not named Cerebus came out of this scene: Croc lasted for 189 issues between 1979-1995. The reason why I bring this is up is because comedy plays a significant role in nation building for the two reasons you mention in your comment: comedy builds cultural consciousness and also generates pride and confidence. Fuddle Duddle is an important piece of this puzzle, as are the BD I mention here. Undergrounds are also certainly comedic, but the emphasis tends to be different. As such, I see this era of parody from the early 1970s as a logical step towards the more serious stuff that would come later, beginning with the science fiction and superhero comics of that came next. I am really looking forward to delving more into these subjects here at CBD and next month I plan to focus on a superhero series that I absolutely adore.